You've all probably heard of the mighty San Diego Comic Con, which started as a small-scale comic-books collectors' convention/swap meet in southern California in the early 1970s. A surprise success beyond its organizers' dreams, it mushroomed into a star-studded, fan-interactive multimedia-entertainment pop-culture showcase, celebrating (and previewing) blockbuster movies, television, home-entertainment and video games for the treasured 18 to 24-year old demographic. So much has San Diego Comic Con become Hollywoodized that comic books and graphic novels themselves are now downgraded to a minor sideline in San Diego. Check out Morgan Spurlock's documentary COMIC CON PART IV: A FAN'S HOPE for details. And if you are Clevelanders, on minimum wage (if employed at all) and too impoverished to even afford the phone call for info on flights to San Diego, Spurlock's movie is about as close as you're ever going to get. Or...it was. But look! Up in the sky! Well, no, down on the lakefront, at the newly refurbished Cleveland Convention Center, the first Wizard World Cleveland Comic Con convenes this weekend. Cleveland Comic Con is not just for comics fans - although there is a healthy section still devoted to graphics readers, with appearances by the legendary Neal Adams, a couple of Eisner Award favorites, plus artists, writers and inkers from Marvel, DC, Dark Horse and plenty of other comics publishers and studios. Always nice to dance with the Supergirl what brung ya. Dig this VIP list: William Shatner! Bruce Campbell! Lou Ferrigno! Corey Feldman! Dre De Matteo! Joey Lauren Adams! Adrian Paul! Plus horror novelist-filmmaker and cinema educator John Russo, Peter Jackson/J.R.R. Tolkein actors Billy Boyd and Graham McTavish, Dr. Who companion Karen Gillan, Power Ranger Jason David Frank (he got to be Green and White Rangers; eat your heart out, LeBron). Actress Danielle Batone appeared prominently in the film version of the Harvey Pekar Cleveland comic AMERICAN SPLENDOR. And, from the world of WWE wrestling, superstars Dolph Ziggler and Paige. And more! In addition to the autograph sessions and meet-and-greets, local Star Trek fan groups will attend, and a prop BACK TO THE FUTURE DeLorean car will be on prominent display. And, of course, there is the unspeakable "cosplay," in which fans show up in costume as their favorite movie/TV/comic/popular culture figure. I have heard that one might be able to find Wonder Woman easily if there is a bar somewhere near. So I've heard. On that note, the convention side attractions include "Sci Fi Speed Dating," panel discussions on film, TV and comics and their synergy, special presentations on Vampire Diaries, reminiscences of Saturday morning superhero cartoons of yesteryear by insiders, World of Warcraft, local filmmaker Ted Sikora with his superhero spoof HERO TOMORROW, and local author Brad Ricca and comics columnist Michael Sangiacomo on Superman's Cleveland roots. Hours of Cleveland Comic Con are Friday, Feb.21, from 3 p.m. to 8 p.m., Saturday, Feb. 22, from 10 a.m. to 7 p.m., and Sunday, Feb. 22, from 11 a.m. to 5 p.m. The Cleveland Convention Center is at 300 Lakeside Ave. downtown. One-day admissions at the door begin at $45 (but brings such perks as limited-edition prints and swag). There are special additional charges for VIP events (come on, William Shatner is worth it), autographs and such. Buying admission online brings discounts, but tickets are going fast. 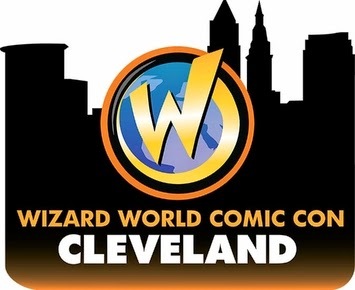 For full information go to the website www.wizardworld.com and click on the "Cleveland" option. And if you can't make it, the same site lists other Wizard World "cons," including one in Columbus this September.